Preheat oven to 350 degrees. In a large saucepan, cook chicken in boiling water until done. Drain, saving water. Chop chicken into small pieces. Add spaghetti to chicken water and cook until done, following directions on package. In another pan, melt butter and sauté celery and onion. Stir in pimento. Add chicken, soup, milk, Velveeta, salt, and pepper. 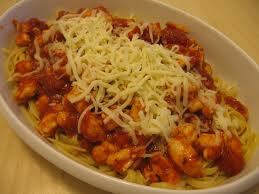 Drain spaghetti and add to chicken mixture. Pour into a greased 9-by-13-inch baking dish. Sprinkle Cheddar on top. Bake for 20 minutes. The chicken spaghetti recipe is ready to serves 8 to 10 people...nice ! Enjoy the spaghetti !